We are the leading institutions indulged in manufacturing & supplying a premium range of PTFE Piston Seal. We hold vast expertise in offering a vast range of PTFE Piston Seal to our reliable clientele. As per the needs and requirements of our clients, we are involved in providing PTFE Piston Seal. In order to cater huge demands of the patrons, we are involved in offering unmatchable quality of PTFE Piston Seals. We are the leading organization in the market to offer the best quality range of PTFE Piston Seal. - Color: Black, White, Green, Red, etc. 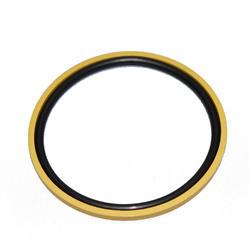 Our company holds vast experience in this domain and is involved in offering PTFE Piston Seal. 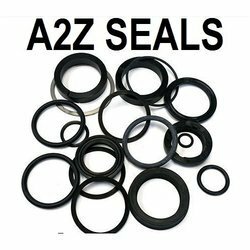 K17 is a two piece double acting piston seal which consists of one special mixture PTFE profile ring and an o-ring as energizing element. The double acting BSF Glyd-Ring is a combination of a slipper seal and an energizing O-Ring. It is produced with an interference fit which together with the squeeze of the O-Ring ensures a good sealing effect even at low pressure. At higher system pressures, the O-Ring is energized by the fluid, pushing the Glyd-Ring against the sealing face with increased force. o-ring activated, asymmetrical PTFE Piston Seal low friction and no stick-slip effect. good adaptation possibilities for diverse temperatures and media by selection of suitable o-ring material, almost no dead spots as required for applications in food and pharma industry. Exubero Sealing Technology Pvt. Ltd.